Quite a few people set resolutions for the New Year. I'm one of them. 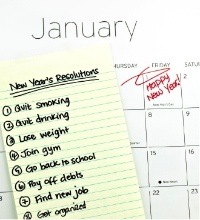 Resolutions shouldn't just be for people--they can be a great motivator for companies as well. Businesses that want to keep their doors open should always set goals, but resolutions are a little different. Goals are often concrete: loose 10 pounds, save $5000 or increase profits 7%. Resolutions on the other hand can be measurable, but are often more open-ended steering you in a new direction that may not have a measurable result. You tend to see resolutions like: loose weight, be kind to strangers or exercise more.Towards the end of every year I set goals for the upcoming year. This year I made a separate list of resolutions and since most all of them directly involve our customers I thought I might as well share them. Offer a wider variety of home furnishings. We have great customers and I get a lot of letters from them letting me know how happy they are with their purchase. Unfortunately, once they have their dining chairs we really don't have a lot of other furniture to offer. I get people telling me that they would buy just about anything that we would make and I want to give them the opportunity. Communicate better. We do a pretty good job now especially pre-sale and during shipping. Where I see room for improvement is post-sale. We need to do a better job following up to ensure the customer is happy. I'd also extend this to sending out emails to customers (that opt-in) about new products that are in the pipeline. I also want to blog more. I've been lax about this lately, especially considering all the great stuff that our customers are doing. Ask customers what they want. Most businesses have products that they offer customers. I think this is the wrong way to go about this. We want to make what you want, so you don't have to make compromises in your decorating. Make our web site more customer-centered. I personally think that we have a great site, but nothing is perfect. I want to customers to have the information at hand when they need it. This is a hard thing to do because you can overload people with too much. The best way to deal with this is showing the customer information based on where they are in the buying process. Offer customers a voice through services such as Facebook, Twitter and Flickr. Our customers have great things to say and they often want to share their experiences or show what they have done. Social networking is the best way to do this and we are going to commit a lot of energy to it. It also opens us up to criticism, but it also keeps us honest and our feet to the fire. I hope this gives you some kind of idea what we are looking to do in 2010. As I've already mentioned, our business revolves around you and we want to hear what you want. Feel free to leave a comment here or send me an email at brad@carringtoncourtdirect.com.